Performed here: and here also on an Aeola with better audio settings. 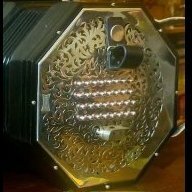 Good evening friends, I've been playing the English concertina for a year now, had a great experience thanks to Paul Hardy in the UK this fall and really have made progress on the EC. I bought a preowned Jackie from Concertina Connections last Christmas. So I have my eye on and my ear open to a 48 key Wheatstone or Lachenal, an intermediate step up. Perhaps I might consider the Concertina Connection Busker EC. But here's the thing. I live in Dallas, Texas. Greg Jowaisas has been very kind to send me sound files of some instruments he has for sale that are in my price range. But while I might be able to choose what I prefer from the sound of one instrument over another, I also have learned that playing the instrument is critical. Paul Hardy was very kind to let me come play the instruments in his collection - and while I didn't have a lot of time to spend playing, what I realized is how unique the feel of the instrument is, the weight, the spacing between the buttons. So I guess my question is how in the world do I purchase that next instrument living here in Dallas, Texas - a long way from any concertina provider. Your thoughts or advice? I have been a lurker on this forum for the past three months as I waited not so patiently for my Busker EC from Concertina Connection. Yesterday it arrived, and I am thrilled. I don't have anything to compare to, but it seems very light and responsive. I got it loaded with metal-capped buttons and the Wakker bellows, so it is probably much like a CC Rose with fewer buttons. During the wait I have listened to a lot of great concertina music, and especially enjoyed Simon Thoumire, and the Leveret CDs. Now I have a lot of patient work to do with much simpler tunes. I would appreciate knowing about EC teachers and players in the Portland, Oregon area. This is a hotbed of Irish music, so I expect Anglo is more plentiful. I look forward to learning more about concertina, and sharing the journey with you all! I'm working through Paul Hardy's Session Tunebook and loving it! The Blackthorn Stick and Off to California are among some of the tunes I"m trying to commit to memory. I'm going to be in England for three weeks this fall and wondering if I will be good on my English concertina to sit in on some sessions. So, this question comes to mind: What ten tunes are most commonly played in sessions that I should have in my fingers and by memory? This may be an oversimplified question as I imagine "favorite tunes" are very much a local matter. Still, I would love to hear your opinions. My English Concertina (stagi tenor treble 56 key) lost one of its metal buttons. The lower part broke. Is there any way out there to get a new one? Or is there hope, that the original button can be fixed? I include a picture of the button and a picture of the action I finally managed to open, so you can see, what I need. If everything fails I may use the button of a rarely used note to fill the gap… but of course, I would prefer it to be "really" fixed Any hints? PS: Don't buy this stagi model! Really badly made. I am part of a new five piece band, DC Ambiance. We play gypsy jazz in the style of Django Reinhardt. Here is a recent recording from a rehearsal. The piece is Jardin D'Hiver https://soundcloud.com/user827948939/jardin-dhiver-1 We will have our first gig at Haydee's Restaurant in DC on Jan 5th. Come if you're in the area. Lea Nicholson, Naomi Randall, "rest Of The Day's Your Own"